Fran Baraonowitz, left, of Ventnor; Krista Sperber, center, of Belmar; and Jody Stewart, of Mystic Island; tell the New Jersey Organizing Project’s first convention in Stafford Township about their long and difficult paths to recovery after Hurricane Sandy. Nancy Ciara, of Waretown in Ocean Township, said her husband’s health problems and loss of his job after Hurricane Sandy, and complications with government assistance programs, have made it difficult to even start raising her home the needed 13 feet, even though she has a RREM grant to do so. 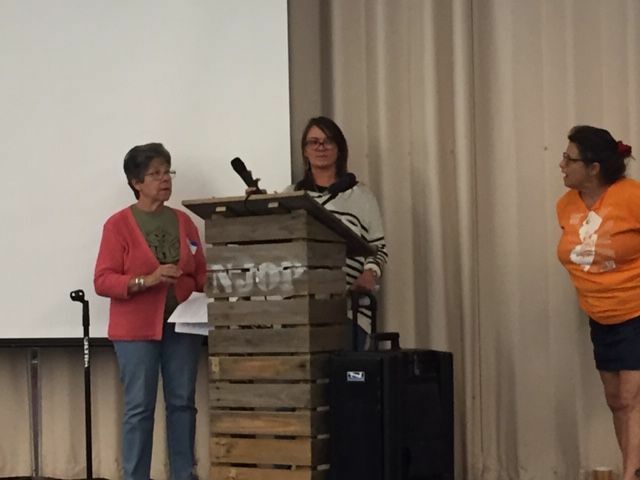 She spoke at the NJ Organizing Project’s first convention in Stafford on Sat. Oct. 13, 2018. Nancy Ciara, left, of Waretown in Ocean Township; Jason Tuber, a Sen. Robert Menendez staffer; and Shana Udvardy of the Union of Concerned Scientists, take part in a workshop on storm recovery and preparing for the next hurricane Oct. 13 during the New Jersey Organizing Project’s first convention in Stafford Township. STAFFORD TOWNSHIP — Almost six years after Hurricane Sandy struck New Jersey, a group that advocates for flood survivors’ rights held its first convention, showing there is still much work to be done in the historic storm’s aftermath. 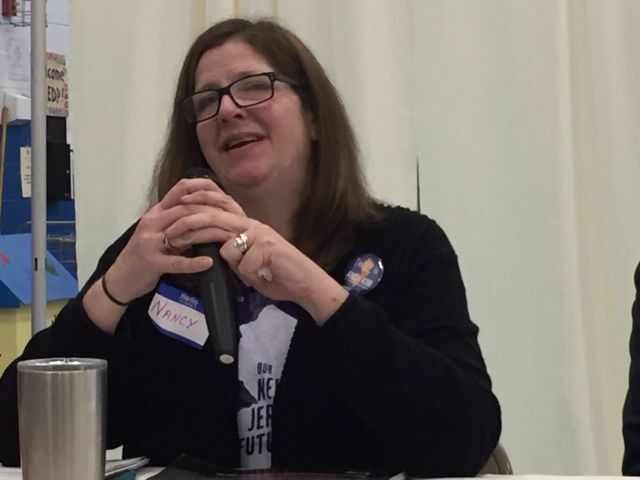 The New Jersey Organizing Project brought survivors together with representatives of government programs, politicians and others to talk about helping state residents finish projects, fight clawbacks of government assistance funds and keep health insurance coverage. The convention was held Oct. 13 at the Ocean Acres Community Center in Manahawkin. Oct. 29 will be the sixth anniversary of Sandy, and 19 percent of the 7,690 families that qualified for Reconstruction, Rehabilitation, Elevation and Mitigation and Low-to-Moderate Income grants still haven’t finished their projects, said NJOP Executive Director Amanda Devecka-Rinear. The grants were funded by more than $4 billion from the federal government and administered by the state Department of Community Affairs. A large number of those who got assistance are being asked to pay back an amount the government has decided was overpaid. Called “clawbacks,” the demands for repayment of tens of thousands of dollars are putting additional stresses on families that have already been pushed to their limits, said Jody Stewart, of the Mystic Island section of Little Egg Harbor Township. Luckily it turned out the government’s paperwork was wrong, Stewart said. She did not owe any money after all. But it was stressful fighting it for a while, she said. Sandy survivors started the New Jersey Organizing Project to better advocate for rental assistance, disaster aid and to help people who were running into roadblocks. It is still focused on making sure families can get home and hang on until they make it home, said Devecka-Rinear. But the group has added two big issues onto its plate, she said. It is working for affordable health care — in particular expanding access to treatment for those with opioid addiction — and for reform of disaster recovery systems so they work better for families and prepare communities for future flooding and storms. How Sandy changed us: Is it enough? Many people affected by Sandy suffered physical or mental health issues in the years that followed, Devecka-Rinear said. Nancy Ciara, of Waretown in Ocean Township, said her husband had a heart attack soon after Sandy, putting him out of work and complicating their ability to help pay to raise their home 13 feet. Even though they have a RREM grant, they ran into many complications and still haven’t started the work, she said. Ciara spoke at a workshop on storm recovery and preparing for future storms, along with the Union of Concerned Scientists’ Shana Udvardy, one of the authors of “Underwater: Rising Seas, Coastal Floods and the Implications for U.S. Coastal Real Estate,” and Jason Tuber, a senior adviser to Sen. Robert Menendez. Tuber talked about reforms Menendez, D-N.J., is seeking through legislation for the National Flood Insurance Program. As of Sept 28, Devecka-Rinear said, the state’s figures show there is about $1.2 billion in unspent Sandy recovery funding, some of which could be redirected to better aid families. People wade and paddle down a flooded street as Hurricane Sandy approaches, Monday, Oct. 29, 2012, in Lindenhurst, N.Y.